The IRS offers a number of senior tax benefits, including deductions and credits. At the state level, you or your loved one may be eligible for even more benefits. Here are the top 10 senior tax benefits, and how you can take advantage of them. If your taxes are relatively simple — you’re not a small business owner, don’t give large sums to charity, and don’t itemize complex business deductions — then you probably already take the standard deduction, a standardized tax deduction that lowers your taxable income. When you’re over 65, the standard deduction increases. The specific amount depends on your filing status and changes each year. For the 2019 tax year, seniors over 65 may increase their standard deduction by $1,300. If both you and your spouse are over 65 and file jointly, you can increase the amount by $2,600. The filing threshold is the amount of income you must earn before being required to file a tax return. Individual factors can affect your filing threshold. For example, if you are self-employed or a small business owner, you must file a tax return for any earnings in excess of $400. For typical taxpayers who are either employees or retired and drawing a pension or Social Security income, the filing threshold is much higher after the age of 65. Single filers under 65 must file a return when their income exceeds $12,000. Seniors don’t have to file a return until their income exceeds $13,600. Married filers who are both over 65 do not need to file a joint return unless their income exceeds $26,600. If your sole or primary income source is Social Security or a pension, this may mean you do not have to file a return at all. Social Security earnings are often exempt from federal income taxes. If you file as an individual and your Social Security and other earnings total less than $25,000 per year, you may not have to pay federal income taxes. If your Social Security and other earnings are between $25,000 and $34,000, you only have to pay income tax on 50 percent of your benefits. Advertising expenses, such as the costs of a website or business cards. Supplies, such as craft-making tools or printing supplies. Expenses paid to a consultant or employee to help you run your business. Business education expenses, such as books about business ownership or the cost of attending a conference. Beginning in 2019, the threshold for deducting medical expenses increased. For seniors with significant healthcare expenses, however, this deduction can still offer tax savings. You are allowed to deduct any medical expenses that exceed 10 percent of your adjusted gross income. The tax credit for the elderly and disabled allows you to deduct money from the total amount owed to the IRS. 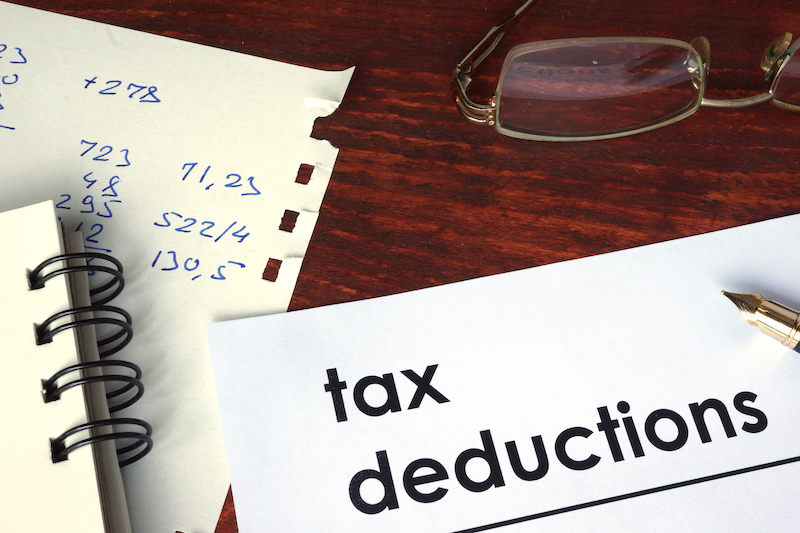 This is different from deductions, which allow you to deduct from your total taxable income. This credit can also get you a tax refund if the deducted amount exceeds the amount you owe the IRS. To be eligible for this credit, you must either be over the age of 65 or permanently disabled. Your income must not exceed certain levels, and those levels change from year to year. For 2019, for example, spouses filing jointly must not have an adjusted gross income in excess of $25,000. The amount of the credit also varies from year to year and changes with filing status. In 2019, spouses filing jointly are eligible for a $7,000 credit. You can deduct most charitable donations, including both money and property donated to charity. For example, if you donate clothing to Goodwill, you can deduct the sale value of the clothing to the charity — not the original sale price. In general, you can only deduct up to 50 percent of your adjusted gross income. If you donate significant amounts to charity or set up a foundation, talk to a tax planner about how to maximize your tax benefits because how you structure your giving may change your tax liability. Many seniors continue working past retirement age. Others keep contributing to their retirement accounts. Retirement plan contributions are often eligible for a saver’s credit that allows you to deduct a portion of the contribution from the amount owed to the IRS. This is distinct from a deduction, which only allows you to deduct from the amount of taxable income you claim. When you withdraw retirement benefits, you do not have to pay income taxes on them. So maintain a diligent account of your retirement income. Home ownership confers a number of tax benefits. Seniors who still pay a mortgage can deduct all mortgage interest on mortgages that do not exceed $750,000. Seniors who sell their homes may worry about capital gains and other taxes on home sale profits. If you lived in your home for at least two out of the previous five years, you do not have to pay any taxes on profits less than $250,000 — or $500,000 for married taxpayers filing jointly. When you sell your home, you can then use the profits to pay for senior living. Senior living that offers healthcare, such as assisted living or memory care, may be deductible as a medical expense. Federal taxes aren’t the only tax burden seniors face. You may also have to file and pay state income taxes. State tax rules vary quite a bit, and the state in which you choose to live can significantly affect your tax liability. The Kentucky state income tax is just 2 percent, and Social Security earnings are exempt. Some states, such as New Hampshire, Nevada, and Florida, do not tax income at all. Mississippi’s state income tax is just 3 percent, with exemptions for Social Security, pensions, and retirement plan withdrawals. Several states, including South Dakota and Montana, have no inheritance tax. If you’re helping a senior parent file their taxes, you’ll already be talking finances, long-term plans, and healthcare. So consider having a conversation about how your loved one wishes to spend their retirement. Re-evaluate this plan each year as your loved one’s needs change. Many seniors can save lots of money by moving into a senior living community. These communities offer loads of activities, easy access to new friends, and a chance at a vibrant and meaningful retirement. For help talking to your loved one about the benefits of senior living, download our free guide, Talking to Your Senior Parent About Senior Care and Living.